'Action Bronson & Friends Watch Ancient Aliens' airs every Thursday at 11 PM EST on VICELAND, nerds. Have you been watching Action Bronson & Friends Watch Ancient Aliens on VICELAND? Because if not, well, you're screwing up. 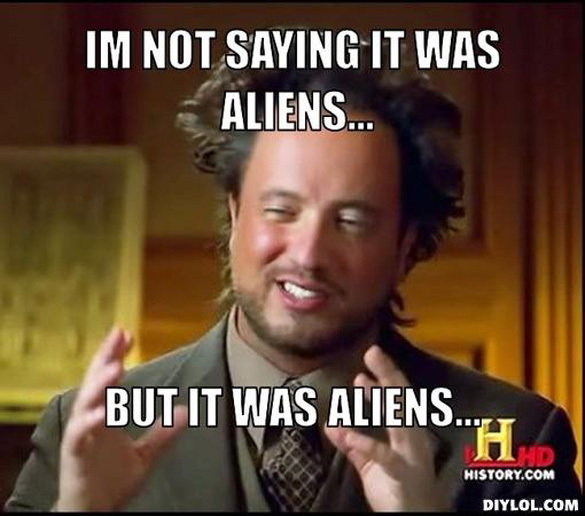 The premise of the show is pretty simple: Action invites his friends to get hella stoned and watch the History Channel's Ancient Aliens—a show about how aliens pretty much created everything on Earth way back in the day, and the show that also birthed this meme—and talk about how it makes them feel. This week's episode featured guest Tyler, the Creator, and he and Action learn that famous historic ruins and structures around the world show construction techniquest hat humans couldn't possibly have made. It's pretty goddamn sweet. You can watch the full episode below, and then watch Action Bronson & Friends Watch Ancient Aliens every Thursday at 11 PM. Want to know if you get VICELAND? Go here to find out how to tune in.